What is the difference between a swarming termite and a flying ant? Because both ants and termites swarm to form new colonies in the spring and summer, it is often easy to confuse the winged reproductive forms. But it is important to differentiate the two. Ants are typically foraging for sweets or protein while termites are making a meal of the wood in your home. There are three key differences between ants and termites. Ants have a pinches waist that connects their body regions; termites do not. Termites have a broad, continuous waist. Second, while both have two pairs of wings, the ant’s wings are different sizes. The front wings are larger than the hind wings. In termites, the two pairs of wings are equal size. Finally, the ants have bent or elbowed antennae protruding from their heads, while the antennae of termites are straight. You can see these distinctions by carefully collecting a specimen on a white index card and viewing the insect with a hand-held magnifying glass. Call Enviroguard at 706-965-9078 and we will dispatch a technician. Termites and carpenter ants have similar skills and behaviors. Both live in nests and are organized in castes of workers, soldiers, and queens. Once a year, queens and males leave their nests to mate and set up new nests, extending their territory. Workers and soldiers collect food, defend the nest and queen, and lead violent attacks against other species. Swarming termites and flying carpenter ants are often mistaken for each other, particularly in the spring and early summer when both have wings and have emerged in a swarm to mate and establish these new colonies. Swarmer termites resemble flying black ants instead of their normal white appearance. Both pests are destructive to wood. Termites eat wood and carpenter ants excavate wood for their nests -- both must be controlled. It is important to correctly identify the pest for the most effective treatment. Flying carpenter ants have elbowed antennae and two pairs of wings, the rear wings are smaller than front wings. These wings have few, well-defined veins. Carpenter ants have skinny, pinched waists and long legs. Swarming termites have straight antennae and while they also have two pairs of wings the wings are the same size and shape. Swarmer termites have finer veins in their wings, creating a lace-like appearance. These flying termites have a broad waist and short legs. Carpenter ants begin their nests in moist, decayed wood and voids (trees, rotting logs, and stumps) and later expand into solid, sound wood. While carpenter ants are important in the balance of nature because they burrow and nest in dead trees and speed the decay of dead wood, when a colony invades and damages the integrity of the wood within your home, they too must be controlled. Carpenter ants remove wood in the form of a coarse sawdust-like material, which they push from the nest and its galleries. This often results in a cone-shaped pile accumulating just below the nest entrance hole. 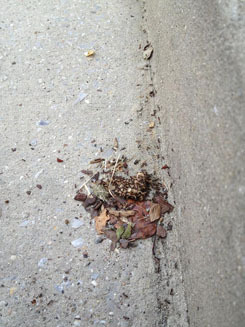 This pile may include, in addition to the wood fragments, other debris from the nest, including bits of soil, dead ants, parts of insects and remnants of other food they consumed. You may even hear sounds produced as workers chew to remove wood to enlarge the nest. They enter buildings around door and window frames, eaves, along plumbing and utility lines, and over branches touching the structure. They forage at night feeding on plants, fruit juices, insects, food debris, meat, cakes, pet foods, and grease. If you identify the swarmer as a termite, you should call Enviroguard at 706-965-9078 immediately to take action against this destructive pest. Usually you do not see any evidence of the termite destruction until their damage is extensive. Termites enter your home through cracks in the foundation and by other wood-to-soil contact. They work continuously eating your home's wood and other cellulose material. Termites "honeycomb" inside wood beams slowly and methodically, typically without breaking through the surface. As a result, their attacks often go undetected for years. Should you spot what you think may be termites, have them checked soon before their damage gets out of control. Consider the presence of swarmers an early warning sign. For carpenter ants, your pest control professional will locate and flush nests and may inject insecticide dust into wall voids. Perimeter treatments also may be applied along with spot treatments at ant entry points. Sprays are used around the base of trees that may harbor nests. Gel baits may be used on trails where carpenter ants enter and leave buildings. For termites, the treatment may include a perimeter pesticide application, baits, and monitoring stations. How can I eliminate ants in my home? If you are bugged by ants, you are not alone. There are more than 600 species of this six-legged insect living in the United States and over 10,000 species of ants have been identified worldwide. Like other insects, ants are social and live in colonies numbering in the thousands. Their nests are commonly underground tunnels with chambers. Some species, like the familiar fire ants, make mounds of earth or anthill as well. These colonial ants are either workers or reproductive varieties. The reproductive "queens" remain in the nest, lay eggs, and tend the young. There may be from one to thirty queens in a colony. The sterile worker ants forage for food, care for the queens and the young, and defend the colonies. Worker ants move the eggs and larvae deep into the nest during the night for protection. During the daytime, they move the eggs and larvae to the top of the nest for warmth. The ants you see in your home or office are worker ants. The most effective way to rid your property of ants is to kill the colony and queens. Ants have three joints on each leg and can run very quickly. They are also strong. It has been said if you could run as fast for your size as an ant can, you would be able to run as fast as a racehorse. Ants can also lift twenty times their body weight. Ants live from 45 to 60 days. They use their antennae for touch, and also for their sense of smell. Their strong jaws open and shut sideways like scissors. They have compound eyes and two stomachs. One holds their own food while the second stomach stores food to be shared with other ants. Ants must be identified as to their species because treatments vary by type of ant. Treatment programs must reach into the colony and kill the egg-laying queens. Current treatments include bait placement on the routes ants travel to and from their colonies, typically cracks and crevices of infested homes and offices. The foraging worker ants locate the bait placements and take the baited food back to the queens and other ants. Within several days, the entire colony can be eliminated. The bait contains food and the ants eat the baited product rather than foraging for other food in your kitchen. It is important to eliminate all food sources competing with bait placements. Often we service homes where the homeowner has used the traditional over the counter insecticides and was unable to control the problem. Over the counter insecticides are only repellents and unless you kill the queen(s) in the nest, the most you can hope for is to kill a few visible worker ants. The rest of the ants detect the presence of the insecticide and move away from the treated areas, often showing up in other parts of your home. New non-repellant insecticides have shown great promise in eliminating several species of ants. Enviroguard incorporate baits and non-repellant technology in a comprehensive control program. Call 706-965-9078 to start controlling ants at your home. Other tips for eliminating ants include vacuuming thoroughly before your pest management professional implements a control program and removing pet food and dishes. 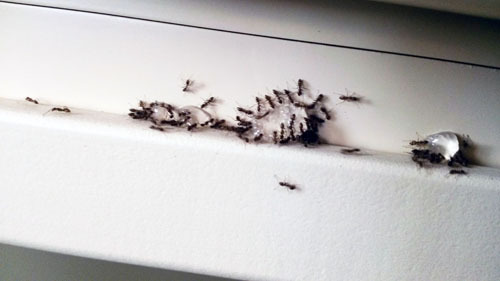 Office infestations are usually from open food or soda cans left on counters, work stations and tables during the day. Enviroguard will develop and implement customized plans to eliminate ant infestations in your specific environment. Why did my technician not want me to use sprays to kill ants in my kitchen? Ants, like termites, are social insects that live in large colonies. Ants are best controlled with baits. Worker ants in the caste distribute the baited food through the colony. The baits contain slow-acting pesticides and the ants carry them to their often inaccessible nests. The bait or toxicant works slowly for a reason – the ants do not die instantly so the colony continues to accept and feed on the bait. Various ants prefer different baits so it is critical to identify the ants you see. If you spray the ants in your kitchen in an attempt to have immediate results, you kill the foraging ant workers and the bait is not brought to the larger nesting colony. Contact insecticide sprays may cause the colony to divide into smaller groups and further spread throughout your house. If you spray on the outside of your home, you may even trap the ants indoors. It is very tempting to want quick relief, but be patient and allow the baits to work. It may take up to four weeks to eliminate some colonies. Enviroguard uses newer insecticides that are very effective against ants and are designed to work in conjunction with baits. Why did my ants return? The larger question is why do any pests invade your home? The acronym PEST provides guidance. First was the Pest properly identified? Ants differ in habitat, feeding and habits. Correctly confirming the pest species offers guidance for control. Exclusion is another key to controlling all pests. Seal cracks and crevices, trim bushes, cut vines, pull mulch away from your home, and keep grass cut. Sanitation is extremely critical. Vacuum floors, dust ceilings and corners, keep food covered and properly stored. Wipe counters and sweep and mop floors. Time is the final issue. Time intervals must be considered. Pest control is designed to reduce pest populations to an acceptable level. Monthly or quarterly pest control at a minimum may be necessary. A one time or even a bi-yearly service is too infrequent to be effective. I keep a spotless kitchen but still have an occasional ant problem. What am I missing? Your warm cozy home may be attracting a few stray ants that can enter through an extremely small opening. Ants are very small and a meal for an ant is even smaller. First you have to think like an ant to discover the hidden food sources they are finding in your seemingly clean kitchen. It's important to clean all areas to remove even the tiniest of crumbs since food sources compete with the baits used to rid your home of the ant colonies. If baits are used to control ants, it can take up to two weeks them to work. Check the following locations to see if you find hidden crumbs. Do you sweep your kitchen or dining area with a broom? Food particles cling to the bottom of the broom when if the broom is stored inside your home, this might be your problem. Similarly a damp mop stored in a pantry closet can contain food particles. Children and pets often spill food items and it finds its way into crevices, corners, and even under appliances. You may need to have someone help you pull out your appliances and thoroughly vacuum and mop under them with a mixture of soapy water and vinegar. Are your pantry products stored on the floor? If so, move them to a higher shelf and remember all non-canned food items should be stored in sealed plastic bags. Check your trash cans for food debris. Wash plastic cans with a bleach and water mixture and allow them to thoroughly dry. Always use plastic trash bags and empty trash to a sealed outside container every day. Check small appliances too. Food particles may be on the can opener. Most have removable cutting arms that can be sanitized in the dishwasher. Crumbs often remain in the toaster or toaster oven. There may be grease on the vent, light, or backsplash. Run the in-sink disposal after each meal and after the dishwasher has completed its cycle to ensure no food particles remaining in the disposal are attracting the ants. Why did I have ants in my car? A customer recently called about a large infestation of ants in her brand new car. This was an unusual call since ants are normally not found in new cars, particularly since there is no apparent food source. While ants might be expected in a family mini-van or SUV where occupants frequently have snacks, brand new cars that have not been snacked in, never attract ants. Upon investigation, technicians discovered the source of her problem. The garage was shared by both the car as well as trash cans and several recycling bins. The family diligently recycled soda cans, food containers, and other food storage wrappers. These were not washed or rinsed prior to storage and the recycling bins were not covered or sealed. In addition their regular trash cans were also stored in the garage. The food had attracted a large quantity of ants. The ants moved around the garage and into her car to forage. The customer had used bait traps purchased from the hardware store with no results. She then inquired about using aerosol bug bombs she had later purchased to eliminate the ants. Bug bombs could harm leather interiors and since the chemical is petroleum-based, it could damage sensitive automobile electronics and stereo systems and will leave an oily film in the car. Also, the products, when used in a confined garage, can be a fire hazard, particularly if used near a gas hot water heater. Enviroguard technicians used liquid ant bait, sealed in baiting stations, to eliminate the ants inside the car and treated the exterior perimeter to eliminate the ant colonies. Always remember that items to be recycled should remain inside sealed storage containers or a dedicated trash cans with a tight fitting lid until collection day. Also regular household trash should never be stored in the garage. Move containers outside, away from the home’s exterior. If trash bags are not used to collect household waste, remember to wash all trash containers with hot water, soap, and bleach on a frequent basis to deter pest entry. Any pet food or bird seed stored in the garage should also be in tightly sealed plastic containers to avoid attracting ants, other insects, and nuisance mammals. Ants are attracted to baits used in their control.